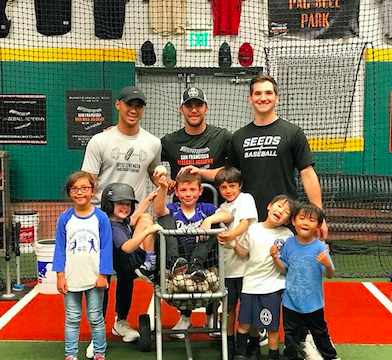 The San Francisco Baseball Academy offers baseball themed birthday parties for people of all ages and skill levels. We customize a unique party which includes lightly competitive games fun for everyone, whether one is playing or watching. Please see below for our available party packages. If in between packages, we can always customize to fit your specific needs. For an additional $100, we can place a special ‘Happy Birthday’ message on the marquee for the day of the event. Come celebrate with the SFBA the party that you'll never forget! A good work environment involves enjoying what you do and who you do it with; That's why the SFBA is the ideal place to hold your next corporate event! We are experts at creating unique events that help build camaraderie within the workplace. Regardless of age or skill level, to make your experience at SFBA fun and enjoyable we have lightly competitive stations of hitting, pitching and fielding games. Our coaches offer expert instruction to those who request it. Food and drink packages are available upon request. A corporate event at the SFBA is a great way to network in a comfortable environment with your friends and co-workers. Email the SFBA for a specialized quote to book the event you’ll never forget!